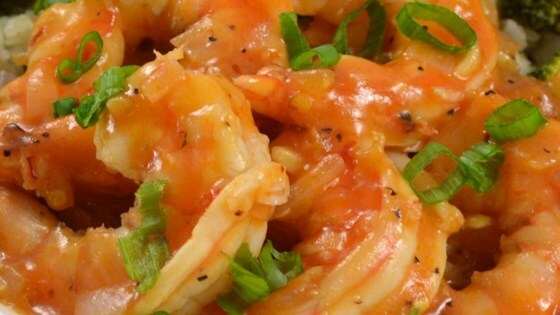 "Spicy large shrimps cooked in beer which my mom makes during weekends." Heat canola oil in a large skillet over high heat, and cook and stir onion, garlic, and ginger just until fragrant, about 15 seconds. Add the shrimp, salt, and black pepper, and cook and stir until the shrimp is slightly pink, about 5 minutes. Stir in the beer, ketchup, and sugar, and bring the sauce to a boil. Dissolve the cornstarch in the water, and stir into the boiling sauce. Cook until the sauce returns to a boil and thickens, the shrimp are bright pink on the outside, and the meat is no longer transparent in the center, about 5 minutes. Stir in the sesame oil; remove from heat. Sprinkle with the green onions. Served at a wine tasting party. Everyone raved about this appetizer! Followed the recipe exactly, it was delicious! I will definitely be making this again. this was a very easy and delicious recipe! I served it over polenta for a main dish.